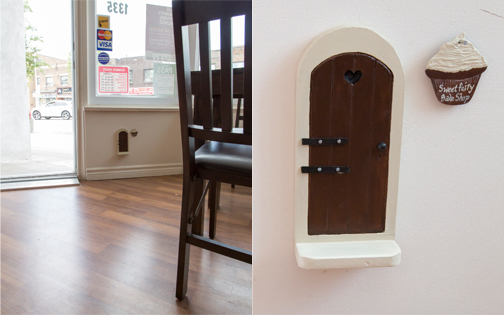 The first time we heard that there were going to be fairy doors showing up along the Danforth, we were a little bit skeptical. After all, we know that fairies don't really like hot weather (thanks to Junior Pioneer #1 for confirming this is true) so we wondered what on earth they were doing on our little strip of Danforth. However, we realized that the Danny's Urban Fairies are really and truly a kindred spirit to our Pioneer-ing nature. They are the new generation of fairies, not afraid of people (kind of like Tink in her most recent appearance in Tinker Bell and the Great Fairy Rescue) and curious about the world. 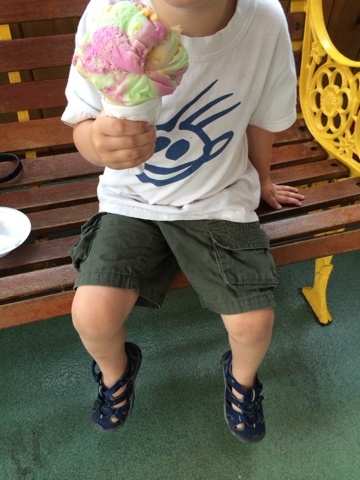 They've picked the most family-friendly strip in Toronto to spend their summer, and a whole bunch of Danforth businesses are welcoming them to their premises. 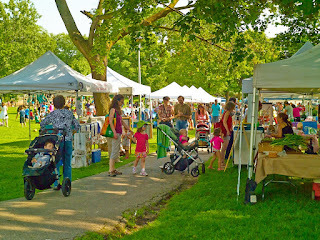 As a celebration of this magical summer filled with pixie dust, they have agreed to appear at various surprise events along the Danforth (with their local host & interpreter Natalie Coulter) so don't miss all the fun. 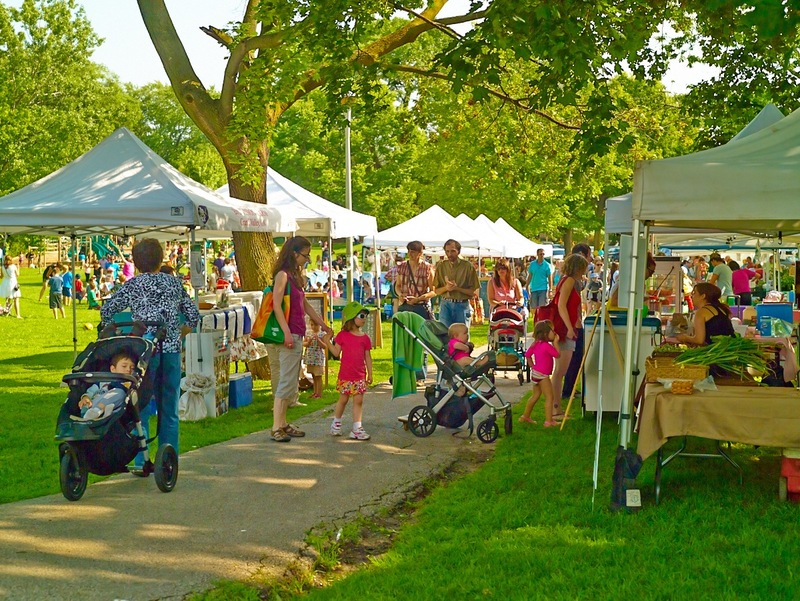 It starts today (July 15) at the Danny Loves Music at East Lynn Park from 6-9 with glitter tattoos for the little ones and some tips for the adults on where exactly to find these homegrown creations. And feel free to post your own fairy discoveries to the Danny's Urban Fairies page - you never know when one will pop up. Faith, trust & a little bit of pixie dust! These fairies at The Borough are very serious about their parliamentary duties, obviously. 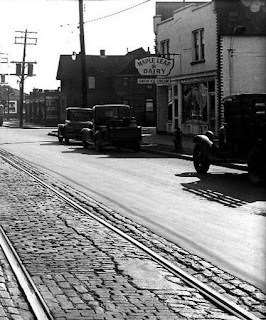 During the wee hours of May 19, the windows of Pioneer HQ were rattling with what sounded like dump trucks cruising up and down our usually serene street, awaking even the soundest sleeper in the house. Finally managing to catch a glimpse out the midnight window, we discovered it was a TTC bus. Enraged, we wondered why they were driving empty buses up and down a side street on the Monday of a long weekend. 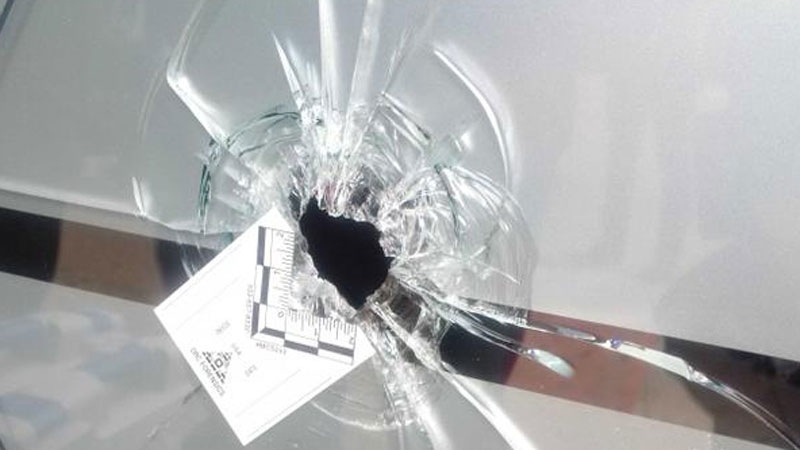 Our sleepy consciousness would never have settled on the truth, that someone had just been murdered only 700m away from our door (and closed down a major bus route). It wasn't until the next morning that the reality of nocturnal Danforth descended on us. At first, we were much like everyone else, grappling with disbelief and not content with the middling answers of our politicians. Once the dust settled though, Pioneer knew we had to take action and do something symbolic and positive, to let the world know Danforth East is still a great place where people care about their 'hood. Thanks to DECA who not only provided funding for the project but also connected Pioneer with neighbourhood volunteer Sherry Lin, a super-mom of two plus a community thinktank 'thinker' in her day job. Two heads are better than one and the idea for our 100in1day #danfortheast mural was born. It was quite a feat to witness, and we are so thankful to everyone who came out and helped paint a picture of what Danforth East means to them. The finished result is 25 feet of heart! Drumroll please......and here it is! The mural has finally made it to its public debut, one month to the day, on the boards next to 1801 Danforth. It took some convincing to get it there, but Daddy Pioneer really just wanted it out of the HQ's basement so he volunteered to do most of the labour to hang it. Thanks! 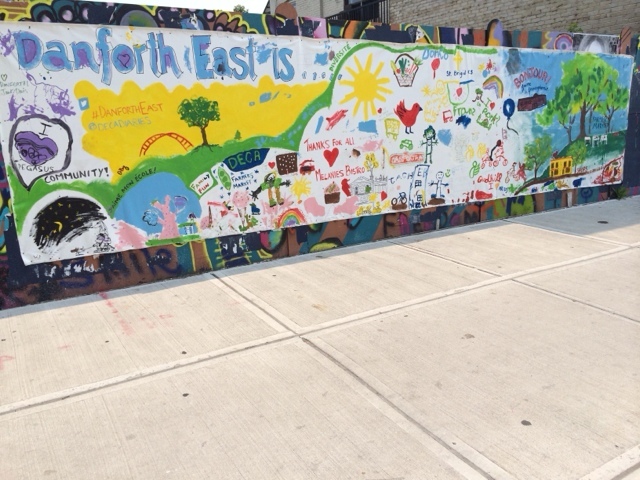 Please take a stroll by and take in some of the loveliness, and if you weren't able to contribute, let us know Danforth East means to YOU in the comments below! Pioneer loves breaking the news about a new business opening up, particularly when it's food related, however this new resto announcement is a bit bitter sweet. 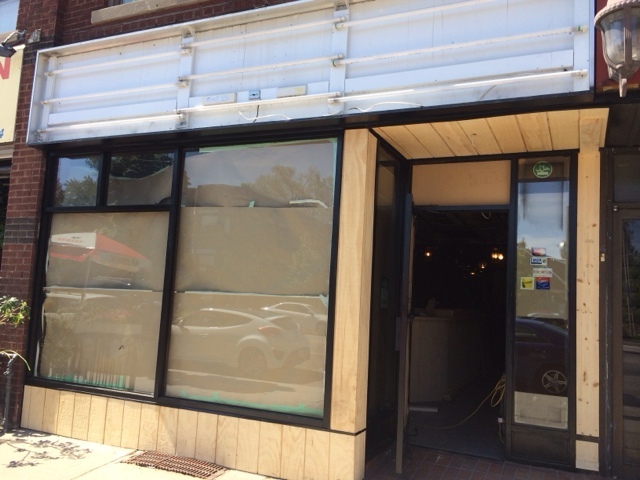 We happened to notice an open door and some construction happening at 1450 Danforth this past weekend and popped our head in to investigate. 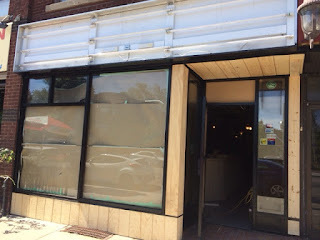 The former Marrakech Restaurant is being overhauled and already has a new facade and exterior. The inside was a construction zone, but one of the crew stopped to chat and shared that there would be a new Magic Oven Pizza opening up. A call to the company's Danforth location confirmed that this is in fact true: the current location will be closing and shifting down to our neck of the woods at the end of July. 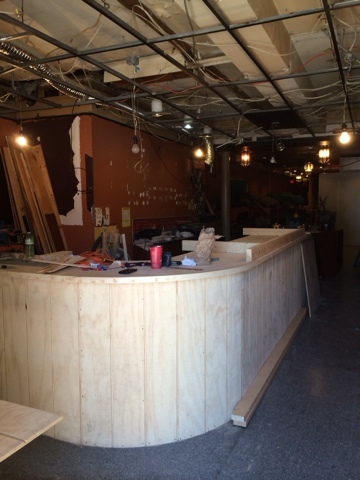 Although we're glad a solid business is opening up on this strip, this will have an impact on our favourite local pizzeria Gerrard Pizza & Spaghetti, who are on that block and already make a long list of fresh custom pizzas the way that mama used to make them. Hopefully there's room for everyone: the experience at both places will be completely different as people head to Gerrards to say hi to Vito and wave to their neighbours over a glass of house wine, while Magic Oven is a destination for pizza lovers from all over (either pick up or dine in). The take-out and delivery option at Magic Oven will probably generate a lot more car traffic issues, but looking at the glass half-full made us realize this will also create more foot traffic which is what this block needs. So although there might be double-parked delivery cars jamming up Danforth on occasion, more people will be walking to pick up their pizza pie! A short post today, as Pioneer is busy getting ready for our community mural project we're working on with DECA. 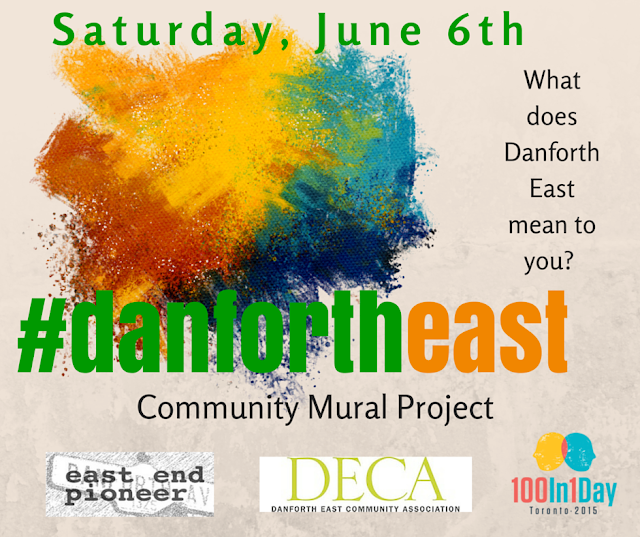 If you haven't heard about it, come down to Coxwell parkette Saturday morning between 9:30 and 12:30 and have your say about what Danforth East means to you in paint. Eephus. Pronounced Ee-Fus. It certainly had a ring to it, so when Pioneer first heard the name of this craft beer, we had to find out what it meant and why. Our ‘research’ led us to a brewery that mixes two good ol’ fashioned past times: beer & baseball. Left Field Brewery is taking Toronto by storm and they’re laying down roots here in the east end. Pioneer was lucky enough to stop by the brand new Left Field brewery on a brew day when the heady scent of yeast was in the air. Co-owner Mandie Murphy was busy putting the finishing touches on the retail shop, which has been open as a pop-up (or in baseball terms, a fly ball) for the past few weeks. For her and her husband Mark, owning their own brewery is a dream come true after spending years building the Left Field empire outside of the GTA. When the couple accidentally discovered an old brick factory tucked into a spot on Wagstaff Drive, they made the big move. It’s taken over a year of renovations, including tearing down pink walls, digging up floors for drainage and replacing windows and doors but the new space is a showstopper. Mandie and Mark live along the Danforth and according to them, picking a spot in the east end was a no brainer. “There’s a strong sense of community here and we knew there was support for local businesses – and no craft brewery yet!” She also pointed out that East York has always represented when it comes to craft beer. After all, The Only has been specializing in it for over a decade. As the province continues to debate about retailing craft beer and the opportunities for growth in that sector, Left Field is a good example of why this is such a relevant conversation. By the numbers, they’ve already made an impact to the community by creating five full time jobs and four part time spots. The brewery has been built to expand in the future to triple its current capacity, which means even more jobs. But we’re forgetting about the most important part of this story. Their beer is good! Actually, it’s great. Left Field brews beers with a focus on quality and flavor, using traditional methods and the best ingredients. Their starting line-up includes five or six regulars plus a star pitcher every so often, including an upcoming collaboration with Pilot Coffee next door. And what about Eephus? We know at least one of our readers is a huge baseball fan and will most likely get this reference, but if your name doesn’t start with a C and end with a Y, you won’t know that it’s the name of a very rare baseball pitch. Thrown only a few times a year, an Eephus catches the batter off guard. Kind of like this Left Field easy drinking brown ale, minus the fat sweaty ump behind the plate. 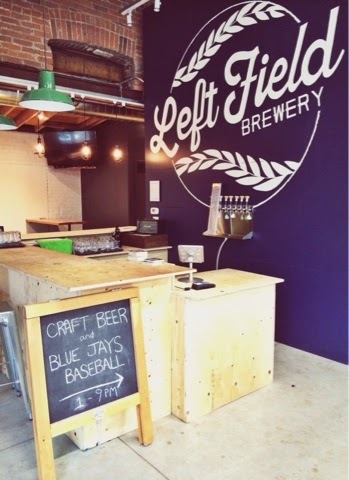 Left Field opens for business at some point in the very near future, but you can catch their fly balls in the meantime so stay tuned to their social media feeds (@LFBrewery & leftfieldbrewery). 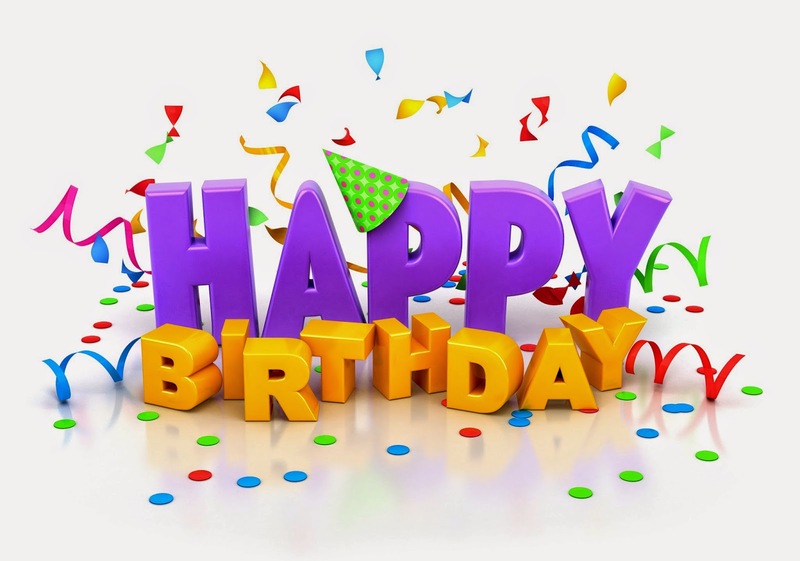 Six years ago today, a small community minded blog was launched into the world and never looked back! Our first month of blogging covered the opening of Legacy Spinning, the 'new' Starbucks at Jones and a mysterious coffee shop called Double Shots. Take a spin through our archives and read some of the gems from the past - we hunted down the best arancini, tried out Moroccan restaurants, went on some walking adventures and watched 800 people line up for Carter's opening day. Thank you so much to the readers who have stuck with us over the last six years, watching this neighbourhood change for the better through our eyes and words. It's been a great experience to be part of. And you're all part of it too - the ground swell of change happening along east Danforth. There is no better place to live in Toronto if you ask us, and even our 50 things list doesn't do this neighbourhood justice. To celebrate the milestone, and to say thanks to all our readers, we're throwing another East End Pioneer party (anyone remember Run/Walk/Pubcrawlin'???) so stay tuned for the details. Here's to hoping that the next six years are as exciting as the ones that just passed! It’s 5am on the Danforth, with a balmy mid-March temperature of -15. You’re probably still deep in slumber, snuggled up in bed listening to the wind howl and glad to be indoors. There is no rest for the weary though when you're training for the Boston Marathon, like Danforth resident Emily Kettel who was most likely lacing up her runners while the rest of us were deep in REM sleep. Only 2,300 Canadians will toe the line tomorrow on Marathon Monday, to get one of the most sought after race medallions in the history of recreational running. Running the Boston Marathon is EPIC for Pioneer and most of the running community, so we were thrilled to chat with Emily about finally qualifying for the big race. She’s been training for her first Boston since December, which means that during most of the frigid winter she was outside doing fartleks, speed work and running long on weekend mornings. Emily’s new to the Danforth area (welcome!) so luckily there were a whole bunch of brand new routes around the east end to discover. So far, her favourite local path is running down Logan past the peaceful Withrow Park as the sun is rising. Favourite place for a post-run refuel? Newly established Goat Coffee on Pape where she reloads with their super-food salads or robust breakfast menu accompanied by a steaming hot espresso. Tonight as we’re sitting down to Sunday dinner, Emily and Black Toe Running mates will be carbo loading (or eating Swiss Chalet if she can find one!) and hitting the hay to make the trek to the start line tomorrow. On how she’s going to handle the infamous Heartbreak Hill, she says slow and steady. Good lucky Emily! East York is rooting you on. For other Toronto runners going to Boston, you can check out this video and following #runTO on Twitter tomorrow.